A stunning collection of Spanish and Latin American songs spanning five centuries. Includes the haunting "Porque es, dama, tanto quereros?" by Diego Pisador, and other works by 16th-century composers, "Estrellita" and "Seis poemas arcaicos" by Manuel Ponce, and two elegant Columbian folksongs arranged by Miguel Sandoval. 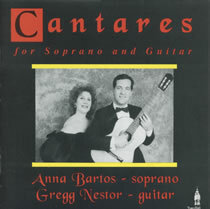 The recording also contains three rare gems: the Spanish cantata: "No se emendera jamas" by Handel, seven Catalonian folksongs arranged by Roberto Gerhard, and Salvador Moreno's "Cuatro Canciones Aztecas," sung in the Aztec language. 01 Pisador: Porque es, dama, tanto querros? 02 Valderrabano: Donde son estas serranas?